Jellyfish floating in the sea are animals without skeleton that eat plankton and other microscopic sea animals after paralysing them with their tentacles. This is possible because tentacles are covered by many particular cells, with a brow leaning. If the brow is touched, a filament comes out injecting an irritating liquid into his catch. 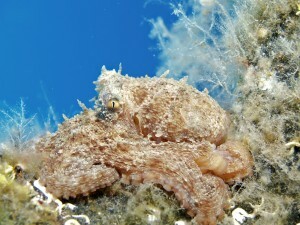 Particular molluscs, like the polyp and the cuttlefish, have their “feet” turned into tentacles around the head and move backwards sucking up the air and throwing it out from the back. When they feel threatened, the spray a liquid that wraps them into a black cloud, through which predators cannot see them.